View More In Game Feeders. A 12-Volt drive motor and two easily interchangeable spreader plates allow you to spread fertilizer, corn, seeds, and more from 4' up to 20'! The three-sided hat spreader plate is used for broadcasts up to 20' wide, while the dish-shaped spreader plate is great for close ranges from 4' to 6' wide. The 60-pound capacity hopper features an internal funnel and a manual cut-off valve to reduce waste when not in use. The spreader mounts to most ATV racks with a two-bolt clamp and can be removed without tools, leaving only the hardware in place for easy re-installation. The 12-volt feeder motor is covered by a manufacturer's lifetime warranty, and an optional 2" receiver mount is available for use on trucks. Caution: Hoppers filled with 50 pounds or more may affect ATV operation and could cause it to overturn. Use extreme care. If you have any questions about this product by On Time, contact us by completing and submitting the form below. If you are looking for a specif part number, please include it with your message. 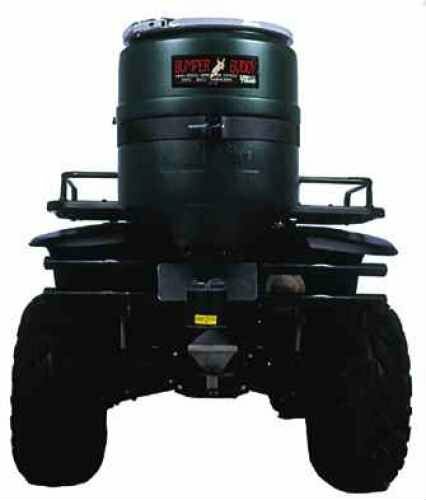 Deer Feeder Filler - Fill Feeders Without Breaking a Sweat....or Your Neck!